30 x 30cm acrylic on paper. The paper is no ordinary paper, it is textured Hahnemuhle 300 gsm 100% alpha cellulose which is acid-free fibre of vegetable origin. A high quality paper, made to last for generations. 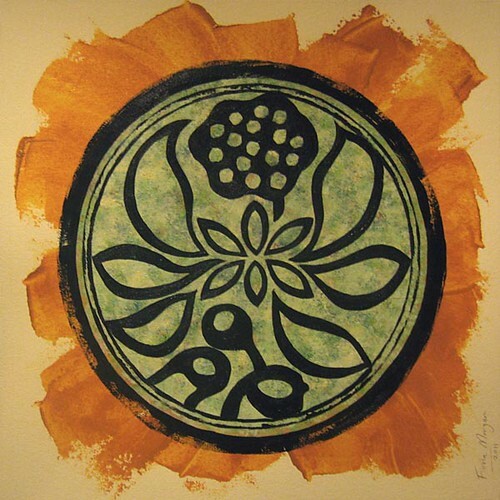 The symbol in this artwork is based on an ancient Chinese lotus charm. The buddah and the lotus are closely connected and I like that the hidden meaning of the charm, continuous harmony, is a suitable sentiment for the celebration of the end of winter and the beginning of a new year that this dish is traditionally served at. From the charm website, "In Buddhism, the lotus represents purity and detachment from worldly cares because of the dignified manner in which it emerges from the muck of a pond. Because the Buddha is often depicted as seated on a lotus, the lotus is considered a sacred Buddhist symbol (one of Eight Auspicious Symbols) representing purity and detachment from worldly cares. The Chinese word for lotus is lianhua or hehua. Lian is also the pronunciation of the word for continuous and he is also the pronunciation for the word harmony so the lotus has the hidden meaning of "continuous harmony"." To be kept updated on available paintings and other happenings of interest, put yourself on the mailing list, yellow box top left. On the first day of Chinese New Year (a variable date in January or Febuary) it is traditional to cook this vegetarian dish. Chinese New Year is meant to mark the end of winter, so as it's officially the first day of spring here in southern hemisphere Australia, this recipe is quite appropriate. Buddah's Delight goes by quite a few names and a vast array of ingredients. I'll get to that bit. You may have heard of it as Monks Vegetables. Or maybe as Lo Han Zai or Zai Choi. As I mentioned, the ingredients are widely varied. I find this dish is as much about sampling different textures together as it is about taste. All the textures are bound together by the flavoured sauce. The sauce varies a lot too. Many recipes use a fermented tofu product as the base of the sauce which some people find nauseating, myself included. It's also a bit tricky to find. Many recipes use a heavily soy sauce based sauce, which I found to be just plain salty and one dimensional. This version uses a modified soy sauce base with heaps more flavour added in and easy on the salt. You should be able to get all the ingredients at your supermarket too. And the last note is that this dish tastes best if at least half of the ingredients are fresh. In other words, minimise the tofu, starch, lotus, noodles, lilybuds and waterchestnut and maximise the vegetables. Get a big pot out for this. No, bigger. Fry the garlic on medium heat until golden in sesame oil. Remove from heat and add sugar, salt, hoisin, soy sauce and sherry. Put back on the heat and simmer until the sugar dissolves. Choose your ingredient selection according to your tastes and what you have available to you. It's more about varied textures than a blend of flavoured ingredients. Use one handful of each ingredient unless noted. Add ingredients one at a time, starting with the one that will take the longest to cook. Braise each for a few minutes before adding the next until all of them are done. Feeds 4-8 depending on the number of ingredients used. It's a bit of a banquet. Serve on a little rice.